Some massage oils leave you feeling greasy after a massage. Our massage oils are made from natural, plant oils which absorb quickly into the skin. They contain sweet almond oil, apricot kernel oil, and sunflower oil, allowing hands to glide over the skin and achieve deep penetration. Our massage oils contain therapeutic quality essential oils for aromatherapy benefits. Edible massage oils contain pure essential oils and/or flavor oils. All of our massage oils are scented for an aromatherapy massage and some are warming types. Our massage oils are made as professional massage oils and can also be used as massage oils between couples who desire a sweeter bonding experience. Aromatherapy massage oils can be used as body oil or as a personal perfume. Free flip top cap available if requested. Following are some of the benefits of sweet almond oil, apricot kernel oil and sunflower oil. Sunflower oil is light, non-greasy oil that won’t leave skin feeling oily. It is made from the oil of from sunflower seeds. It is rich in the essential fatty acid linoleic acid, as well as palmitic and stearic acids, which are all components of healthy skin. Linoleic acid in skin declines with age and can be stripped by harsh soaps and cleansers. 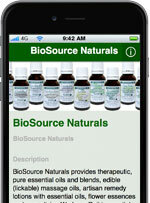 Daily use of BioSource Naturals Massage Oils / Body Oils after a shower or bath is recommended. Note: People with allergies to the sunflower plant family should avoid sunflower oil. Sweet almond oil is pale yellow in color. It is slightly oily, which allows hands to glide easily over skin. Sweet almond oil is absorbed fairly quickly, but not so quickly that you need to keep reapplying it. People with nut allergies should not use almond oil. Apricot kernel oil is similar in texture and color to almond oil. It is rich in vitamin E, a quality that gives it a longer shelf life than the typical oil. Like almond oil, apricot kernel oil is absorbed into the skin, so it won’t leave people feeling greasy afterwards. This property also makes it a good oil to use for aromatherapy massage.